AKI is common, has no treatment aside from supportive care, and is associated with increased patient morbidity and mortality. This has led to renewed vigor in the search for effective therapies. However, despite many promising preclinical studies, translation into a sound evidence base to guide clinical practice is lacking. 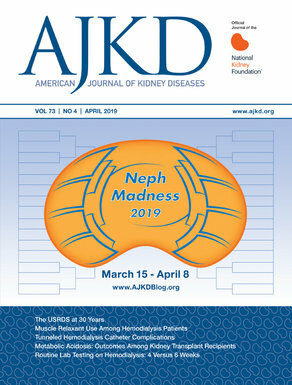 A recent review by Leaf & Waikar in AJKD describes the challenges of clinical trial design in AKI and proposes guidance for selection of trial end points. First, the definition of AKI largely depends upon a rise in the serum creatinine, which, as a marker of kidney function, occurs well after any such injury has occurred. There is a need for a direct marker of kidney injury, a “renal troponin,” to identify AKI in real time. Although many urinary and serum biomarkers predate changes in serum creatinine, there is currently insufficient evidence to support their use as a surrogate endpoint in clinical trials. Instead, they might best be used to enrich trial recruitment, maximizing event rates by identifying those most at risk. When considering trial end points, the diverse and often multifactorial etiologies of AKI can lead to challenges in trial design. The Leaf & Waikar review divides the main priorities for research into AKI prevention and treatment, in the context of predictive insults after radiocontrast administration and cardiac surgery. Table 3 from Leaf and Waikar AJKD, © National Kidney Foundation. In preventative studies, the benefit of avoiding small rises in creatinine on long-term patient outcomes has yet to be proven. Alternative end points with a higher event rate, such as diagnosis of AKI by stage, are appropriate for smaller explorative Phase I or II studies, but more clinically meaningful patient outcomes (such as death or need for RRT) should be used for Phase III studies. Composite end points have higher event rates and therefore increase statistical power while reducing bias due to competing risk. One such example is the major adverse kidney events (MAKE90) score: a composite end point of need for RRT, 90-day increase in serum creatinine ≥1.5× baseline, or 90-day mortality. This end point is currently being used in the eagerly anticipated PRESERVE (Prevention of Serious Adverse Events following Angiography) trial in patients at risk of contrast nephropathy. In trials of treatment of established AKI, Leaf & Waikar suggest that RRT and hospital mortality should be reported, on account of their clinical relevance. RRT as an end point has its own caveats, given that the indication for its initiation is subjective, and not all patients elect to have RRT or are deemed fit enough for it. Reporting “clinically indicated RRT” rather than “RRT provided” would perhaps be more useful. Renal-failure­–free days is a novel outcome measure defined as the number of days up to day 14 during which a patient has a serum creatinine below a specified threshold, as long as RRT is taken into account. Importantly, once established, recovery from RRT is rarely reported as a trial end point. It is suggested that in interventional studies in patients with RRT-requiring AKI, a composite end point of both survival and RRT independence should be adopted to demonstrate maximal patient benefit. Overall, despite our increased understanding of AKI’s relevance to patient outcomes, and strategies such as the ISN’s 0by25 AKI Initiative, there are significant challenges to translating therapeutics from bench to bedside in AKI. Leaf & Waikar advocate trial design with appropriate patient selection and suitable end points to identify meaningful treatment effects. Post written by guest contributor Dr. Fiona Duthie, Nephrology Fellow, Royal Infirmary of Edinburgh, and edited by Dr. Paul Phelan, AJKD Blog Contributor.